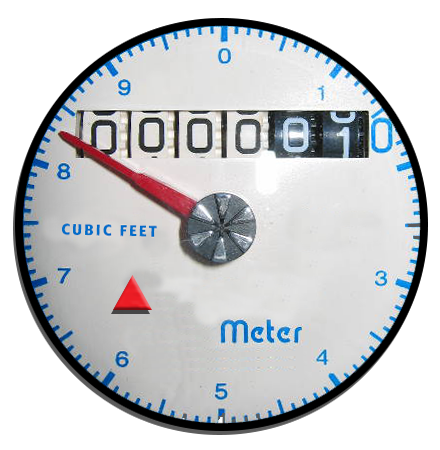 A water meter is a device that measures the amount of water delivered to your propery. PID's meters measure water in cubic feet. One cubic foot equals 7.48 gallons. Meters are usually located near the street in front of your home or business and are protected within a green plastic or concrete box with a lid. PID meters also have a disc-shaped antenna attached to the lid or located near the box. This antenna is connected to the analog meter with a thick wire and is used to electronically transmit the meter read to our data center each day. To open the meter box, use a long screwdriver to remove the lid. Be careful not to disconnect the antenna from the meter inside the box. Be cautious of insects or other small animals that may have taken up residence inside the box. Keep it trimmed - You'll be able to turn off your water meter quickly in the event of an emergency if you can easily find it. Know where your water meter is and cut the plants back every month or so. The district implemented its automatic meter reading (AMR) system in 2012. Water meters are not regularly visited by PID employees - meaning the plants may have grown up around the meters, making them hard to spot. In case of an emergency, knowing where the meter is and being able to quickly access it will make it much easier to turn off the property's water at the meter, if necessary. If you're not sure where your water meter is, give our customer service specialits a call at 877-4971. They can help guide you to the right location. The sweep hand - moves clockwise around the dial. One rotation = one cubic foot of usage. The leak indicator - makes it easy to spot a small leak. This triangle (or gear on some meters) will turn even when the sweep hand is moving too slowly to recognize movement. The meter register works the same as the odometer in your car. You can record and compare meter readings to determine water used during a period in time. Make sure everyone in the home knows not to use water while you're doing your investigation. Ensure laundry and dish-washing machines are not running. Sweep hand - if the sweep hand is moving you have a leak. Leak indicator - if the leak indicator is turning you have a leak. Take meter readings to determine a very slow leak. - Read your water meter and record the numbers on the register (call this "Read 1"). 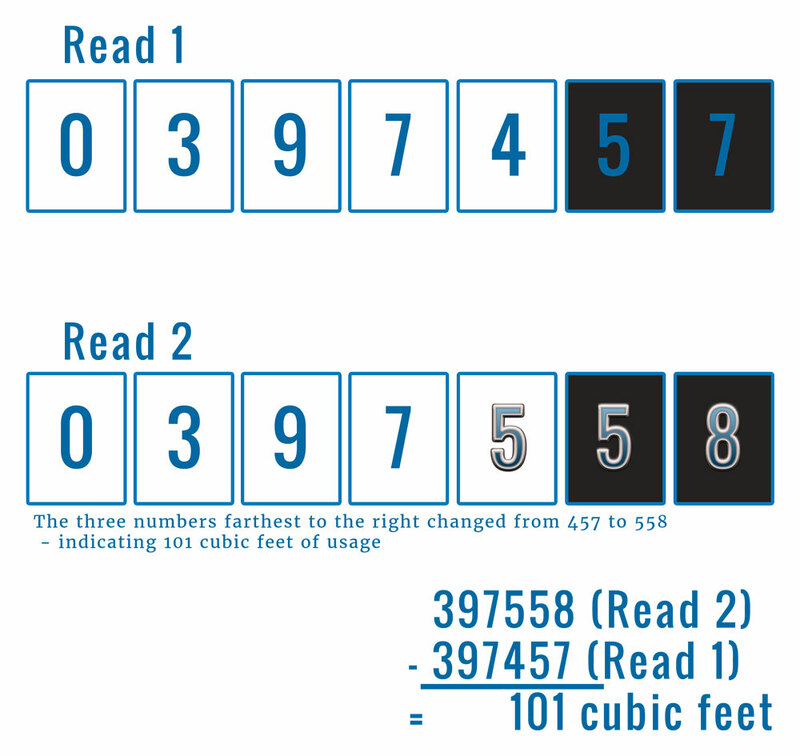 - Read your meter again and record these numbers (call this "Read 2"). - Subtract Read 1 from Read 2. - If the cubic feet are greater than zero you have a leak. Take the guesswork out of determing if you have a leak. Sign up for AquaHawk and we'll send you a message if you have a leak. Choose between phone call, email or text messages.